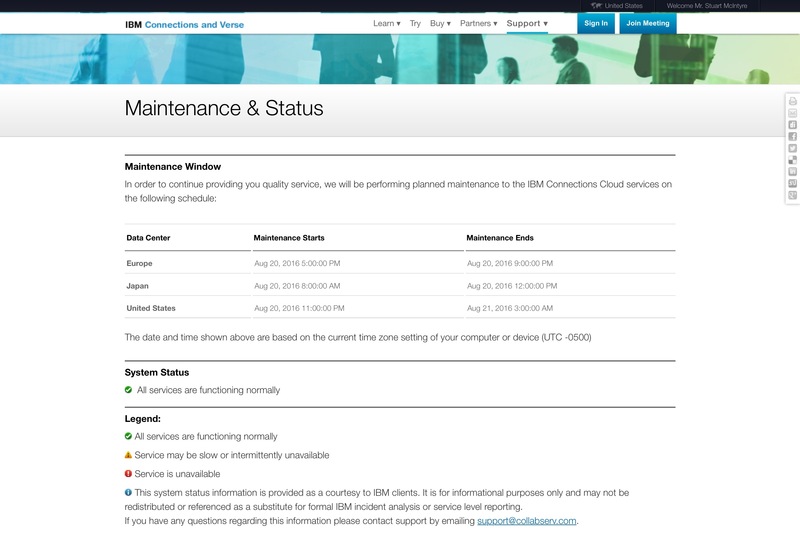 Like many long-time IBM Connections Cloud users, my muscle memory was to access the site via the lotuslive.com URL (the longest-lasting of the few brands that service has had over the years). 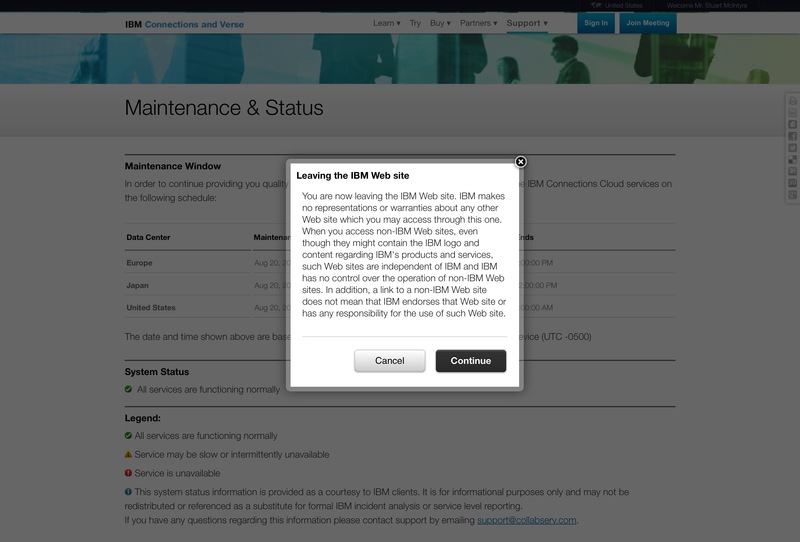 Now I’m not arguing that IBM doesn’t need to tell users (or at least organisation administrators) that there will be potential downtime in the near future, but it seems very curious to make this the ‘front and centre’ experience that all users see when going to the most obvious service URL. It appears to accentuate the fact that this isn’t an ‘always on’ service, and is something that I cannot imagine Google or Microsoft doing on their primary customer-facing home page for a paid service. You are now leaving the IBM Web site. IBM makes no representations or warranties about any other Web site which you may access through this one. When you access non-IBM Web sites, even though they might contain the IBM logo and content regarding IBM’s products and services, such Web sites are independent of IBM and IBM has no control over the operation of non-IBM Web sites. In addition, a link to a non-IBM Web site does not mean that IBM endorses that Web site or has any responsibility for the use of such Web site. Now, I know there might be a better, more specific URL to use to login (Most likely https://apps.na.collabserv.com/), and some larger customers may have vanity URLs for their own Connections Cloud service. However, for the majority of accounts, including those new to the service, this is not a great customer experience. Am I missing something? Is there a better route into Connections Cloud for the uninitiated? Either way, I see no reason why this experience shouldn’t be improved for those that hit that collabserv.com URL themselves.